Barbecued foil packets are a quick and easy way to get dinner on the table. 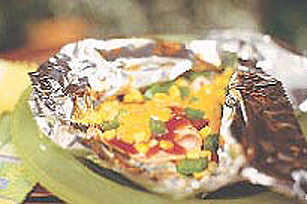 Filled with ham, veggies, barbecue sauce and cheese, these grilled foil packets make dinner prep and clean-up a snap. Place a few slices of deli ham in centre of large sheet heavy-duty aluminum foil. Top with 2 Tbsp. Kraft Original BBQ Sauce, 1/2 cup Corn Kernels, 1/4 cup chopped green pepper and 1 Tbsp. Cheez Whiz Spread. Bring up foil sides. Double fold top and ends to seal packet, leaving room for heat circulation inside. Place on medium heat on barbecue. Grill covered for 8 min.